For additional ticket questions, please contact the Jefferson Center at 540-345-2550. *The information on this page has been fully updated and is current. Saturday, December 8th at 1:00 and 7:00 PM at Shaftman Performance Hall at the Jefferson Center, Roanoke VA.
Come and hear the beauty of 250 angelic children's voices ringing in the holiday season! It is sure to be a wonderful show! Tickets are available through the Jefferson Center at 540-345-2550 or jeffcenter.org/RVCC-holiday2018. Pricing is $22, $19, $16 with a $3 discount for children 12 and under. Repertoire will include songs from the Polar Express, the Nutcrackers, and many exciting and beautiful arrangements of holiday favorites! The choir’s special musical guests will include the Roanoke Chamber Brass, Julee Hickox on flute, student Misha Wiley, cello, and several string players from the Roanoke Symphony Orchestra. The Children’s Choir is made up of 250 children ages 8-18 divided into 3 training choirs and a concert choir. Students are accepted into the choir through auditions held in the spring of each year. 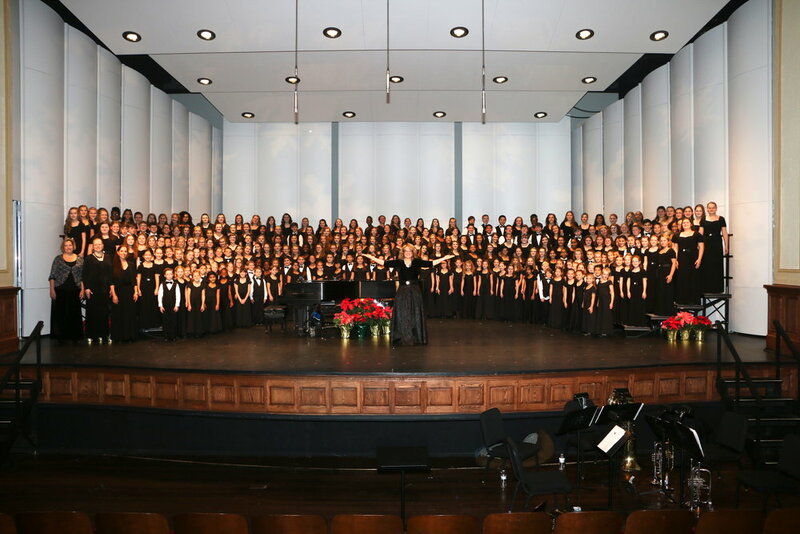 Recent featured performances for the RVCC Concert Choir include the 2008 and 2014 Southern Division American Choral Director Conventions, the ACDA National Convention in Salt Lake City, Utah on February 28, 2015, a solo performance at Carnegie Hall in June 2016, and Festival and Solo performances in Canterbury and London in 2017. The RVCC will host a Community Carol Sing-A-Long at the Taubman Museum on Friday, December 14, from 7:00-7:30. Admission is free. Come and hear this nationally recognized choir as they celebrate the holidays with our community! Newcomer Auditions for the 18-19 season are May 2, 3, 4, 2019. Please see our website for more information. auditions.childrenschoir.com.